Dortmund vs Hoffenheim saw both sides play their roles in an unbelievable football match that finished in a thrilling 3-3 draw. 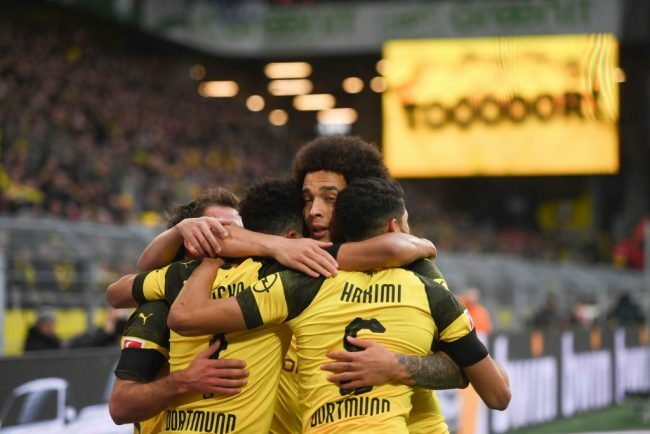 Jadon Sancho sizzled as Dortmund took a 3-0 lead with the game looking all but over, but Ishak Belfodil inspired Hoffenheim to a miraculous come-back when they looked dead and buried. Borussia Dortmund were completely dominant in the first half and deservedly led 2-0 through goals from Jadon Sancho and Mario Götze. Sancho was unplayable – combining with Götze (who assisted Raphael Guerreiro) only the post denied Englishman the chance to make it 4-0. What happened next defied all logic. Two Ishak Belfodil goals – either side of Pavel Kaderábek’s header – gave Hoffenheim a point that looked beyond their reach with 15 minutes remaining. Dortmund supporters are unlikely to agree, but this was another reminder of why we love the beautiful game. Dortmund vs Hoffenheim : How did Hoffenheim make it happen? Julian Nagalesmann made two symbolic substitutions at half-time, with Andrej Kramaric and Kerem Demirbay hooked for Ishak Belfodil and Dennis Geiger. I have never seen Die Kraichgauer play as poorly as they had in the opening 45 minutes, but Belfodil and Geiger then played a significant role getting the visitors get back into the game. Joelinton was also influential, busy early on and showing his customary work rate and link up play. The Brazilian forward tested Roman Bürki with a fierce strike after Nico Schulz has gone close to put Dortmund on notice. Two headed efforts from corners went close to getting Hoffenheim back into the game but Dortmund didn’t heed the warnings. Belfodil was becoming more involved and got his deserved goal after Pavel Kaderábek’s cross fell to him at the back post. Kaderábek then headed home to reduce the deficit to 3-2, before Belfodil headed in Geiger’s free kick to make it 3-3. The nervous hosts were culpable for each goal – Abdou Diallo failing to clear the first, Achraf Hakimi beaten for the second and the team collectively at fault for the third. 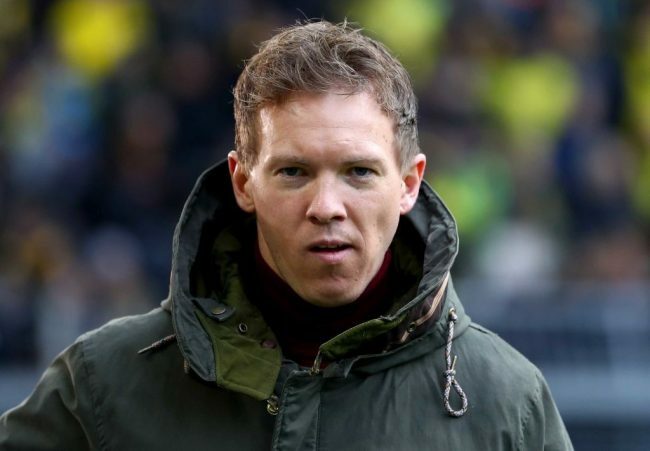 Credit to Nagelsmann for making two important changes at half-time and giving his side the inspiration and belief to get back into the game. Borussia Dortmund were far too good in the first half, Jadon Sancho at his best and continually tormenting Hoffenheim’s defence. A 2-0 lead was just reward with Bürki not required to make a save. 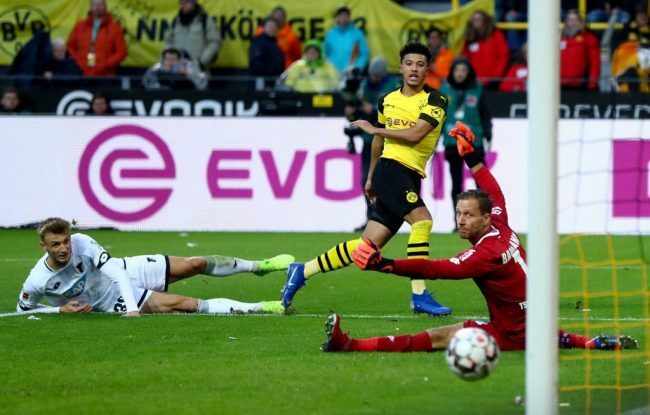 After weathering an early storm in the second half, Guerreiro’s goal looked to have sealed the win and Sancho’s effort that hit the post would surely have killed the game. What followed was an unbelievable transformation. Dortmund looked nervous with a 3-1 lead and Mario Götze’s late withdrawal for Ömer Toprak was significant. Hoffenheim had all the momentum and Dortmund couldn’t stem the tide with two vital points thrown away. It should be noted that the hosts were without their influential captain Marco Reus, the suspended Thomas Delaney and manager Lucien Favre was too ill to take his spot in the dugout. However, there is never any excuse for throwing away a 3-0 lead in front of your own fans. Jadon Sancho began the match in a confident mood and went close to giving Dortmund the lead. The 18-year-old was going past Hoffenheim players with ease and making them look so amateurish they could only take matters into their own hands with physical fouls. Sancho was giving Nico Schulz, Benjamin Hübner and Stefan Posch a torrid time before playing a one-two with Lukas Piscczek, driving into the box and firing past Oliver Baumann to put Dortmund in front. The English superstar then decided to switch his attention to the left wing and didn’t take long to get involved. Ermin Bicakcic and Pavel Kaderábek stood no chance, Sancho going clear once again with his shot saved by Baumann but Götze pounced to make it 2-0. In the second half Sancho’s back heel put Götze in space as Guerreiro finished off a brilliant team move, only the woodwork denying the youngster making it 4-0. It was a breathtaking performance, Hoffenheim’s defenders terrified of going anywhere near him and unable to stop his dazzling dribbles. The late foul on Grillitsch took some gloss off the performance, but it shouldn’t diminish another outstanding man of the match performance from a very special player.